The luxury of a luscious ripe fig is extraordinary. The soft and yielding fruit is full of seeds, but the seeds are so small they just add to the unique texture that makes fresh figs so sought after. Most varieties are intensely sweet, so they get used in desserts. That works, of course, but I also like to use that honey-like sweetness to cut sharper savory flavors. Below you'll see when fresh figs are in season, learn how to store them, and find some great ways to highlight figs' sugary ways with piquant, bitter, and salty pairings. Figs are fragile. Rare is the fig shopper who finds perfect, unmarred fresh figs. Lucky for the rest of us, slightly wrinkled (but still plump) and even split figs (as long as they are not weeping or leaking), are what you want. A bit of bend at the stem and a slight weariness to the skin both indicate better ripeness and flavor that taunt shiny skins and stems that look like they're still grasping for the tree. Avoid figs that look shrunken are oozing from their splits, have milky liquid around the stem, or are super squishy. It also seems obvious, but just to make sure you know what to look for, avoid figs with any sign of mold. Be sure to check on the underside of the container, if they're in one, for these signals that the figs are better suited for the compost than consumption. Black Mission and Brown Turkey figs seem to be the most common in most markets, but a wide range of figs—including striped Adriatic figs and pale green Kadota figs—is increasingly available fresh. 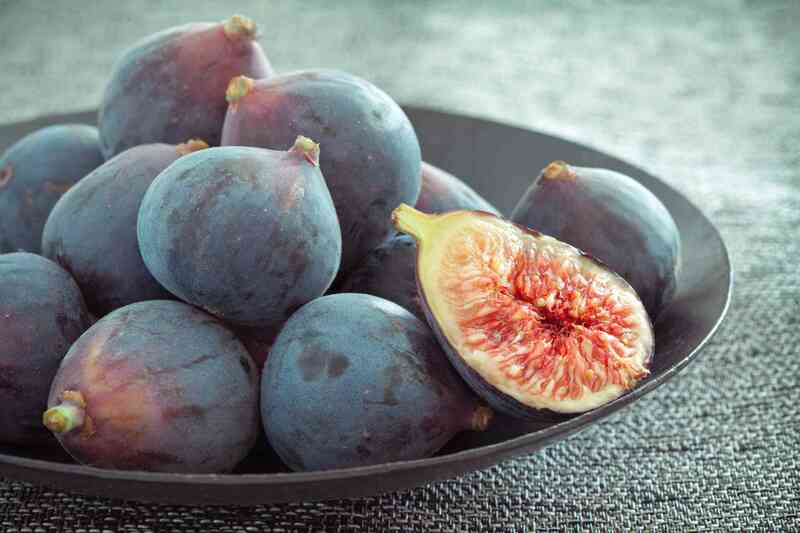 While there are subtle differences in flavor and sweetness level, figs do more or less taste like figs, so there's no reason to be wary of trying a new variety. A sweet, honeyed taste and a soft (some might say squishy) texture make fresh figs worth seeking out. Unctuous fruit studded with discernible seeds are a far cry from the dried figs most people know. That yielding texture makes them particularly sensitive to travel since they split and spoil quickly when not handled with kid gloves, a fact that makes fresh figs even more seductive and finding a source for locally grown ones worth the effort. Figs have two seasons. A quick, shorter season in early summer and a second, main crop that starts in late summer and runs through fall. Figs cannot withstand temperatures much below 20°F, and so they are not available from local sources in much of the Midwest and the northeastern U.S.
Not for long! Fresh figs wait for no one, so plan on eating them within a day or two of buying them. They keep best at room temperature with plenty of air circulating around them. They will keep a bit longer in the refrigerator, but chilling detracts a bit from their full flavor, so try to avoid it. Aged Cheese figs are famously delicious with blue cheeses, but their sweetness makes them work with any salty aged cheese. Aromatics such as garlic, olives, capers Fig Coulis is a wonderful recipe to try these combinations. If you're lucky enough to live somewhere that fig trees can thrive, growing a fig tree can be pretty darn easy. Watch out for animals, who'll eat the fruit before it becomes ripe.